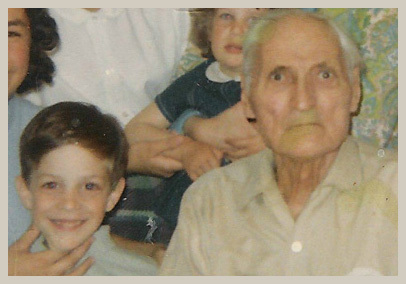 When I was a little boy, about 5 or 6, my family would visit my grandfather every Sunday. Because I was his only grandson and namesake, Luigi rolled out the red carpet for me. At this point in his life, he was a very sick man, so most my contact with him was usually a hug at his bedside or a pat on the head. I remember feeling nothing but affection and unconditional love. I was fascinated with my grandfather and perhaps a little afraid of him as well. His craggy, Romanesque features made him look like an old Indian chief, and he liked to tease me with the indentation in the palm of his hand; an old wound he received from the First World War. I remember basking in the attention he gave me on those Sunday mornings. When he was feeling strong enough, he would walk me over to the marble self-portrait he had carved and help me stand on a chair so I could put his fedora on his own carved head. Then he would look down at me and say in his broken English, “I am Luigi, you are Luigi”. Those are the only words I remember my grandfather ever saying to me, but I never forgot them. He died a just few months later. From then on I always tried to find a way to connect to him. In 2nd grade I discovered some old pamphlets on Mount Rushmore. I asked my mother about them and she explained to me that my grandfather was the chief carver and that he had brought Lincoln’s eyes to life. I couldn’t believe what I was hearing! I asked her if I could take the pamphlets to school to show my class. Even though I was a painfully shy child, this idea of sharing such exciting news with my peers gave me a rush of self confidence I had never experienced before. I can still remember how I felt in front of my class; pamphlets clutched in hand and proudly proclaiming that I was the grandson of the chief carver on the greatest American monument. That feeling is still with me today. It’s amazing how someone can have such a profound effect on your life, even if they are only with you for a short time. I now make my living as an actor, singer and storyteller, a career I find so fulfilling because it allows me to express myself through the arts. I may not be in the same field as my grandfather, but I am an artist just like he was, and I dedicate this website to him and what he expressed so powerfully, though his art, for all the world to see. WE ARE EXPERIENCING TECHNICAL DIFFICULTIES WITH OUR WEB FORM. FOR MEDIA OPPORTUNITIES AND/OR PERFORMANCE AND BOOK SIGNINGS FOR OUT OF RUSHMORE’S SHADOW, CALL 914-937-0897 OR EMAIL LDB31@ICLOUD.COM.